Home Business So Why Did We Bother To Rescue The Banking System? So Why Did We Bother To Rescue The Banking System? Firms in many countries, especially in Europe, are heavily dependent on banks to finance investment, and so allocating credit to its best use is a major function of the banking sector. By terminating credit lines to firms with poor prospects, banks release capital that would otherwise be locked up in unproductive uses and make it available to invest in new or expanding firms. When they do this, banks support the Schumpeterian process of creative destruction. Given the dominant role of banks in financing aggregate investment, the banking system’s structural parameters importantly influence the flow of credit and capital. For a long time research has suggested that a well-functioning financial system is important to support the efficient allocation of capital. For example, Wurgler (2000) established that countries with a developed financial sector are better able to reallocate investment towards more productive and fast-growing industries, and away from declining sectors. Evidence from the US (Acharya et al. 2011) and France (Bertrand et al. 2007) shows that banking reforms can render capital allocation more efficient. Conversely, a weak financial sector blocks reallocation. Troubled banks fear they will violate regulatory standards if they write off non-performing loans, and so often delay the liquidation of loans to unproductive or quasi-insolvent ‘Zombie firms’. Japan’s ‘lost decade’ in the 1990s, after the collapse of asset prices and collateral values, is a prominent example (Peek and Rosengren 2005, Caballero et al. 2008). It locked up capital in unprofitable uses, creating investment distortions and delaying the recovery. 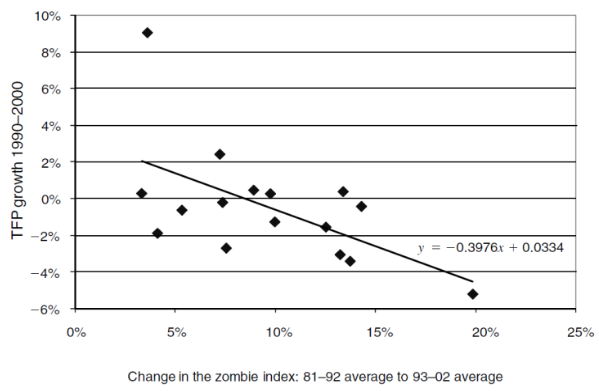 Productivity growth was significantly lower in industries with many such ‘Zombie firms’ (Figure 1). Source: Caballero et al. (2008). Recent evidence points to similar problems in the euro area after the financial crisis (Acharya et al. 2016, Schivardi et al. 2017). Gopinath et al. (2017) relate low productivity growth in Southern Europe (Spain, Portugal and Italy) to large capital inflows, a relatively weak financial sector and large capital misallocation. They do not find a similar increase of misallocation in countries with more robust banking sectors such as Germany, France, and Norway. The recapitalisation of banks has become a priority for euro area policy to speed up recovery from the recent crisis and strengthen long-term growth. These policies focus on financial stability, but also connect to the role of finance in Schumpeterian creative destruction to foster innovation and growth. In our theoretical work (Keuschnigg and Kogler 2018), we argue that the efficiency of credit reallocation will continue to be important long after the crisis, and it depends on more than just the capital ratio of banks. Capital reallocation is a permanent challenge in an economy driven by creative destruction. It boils down to the efficiency of credit reallocation when the financing of firms depends on banks rather than capital markets. Clearly, banks must play a critical role in making trade-induced structural change possible, that necessarily rests on capital and labour flowing from shrinking to expanding sectors. Mussa (1978) emphasised that this process has frictions, consumes resources, and may result in permanent changes to industry structure. Domestic institutions that mitigate or overcome financial frictions therefore become important determinants of specialisation and trade (Nunn and Trefler 2014). In spite of banks’ importance in financing aggregate investment, research in trade has largely neglected their role in factor reallocation. Our research focuses on the role of banks. As the rate of credit reallocation depends on endogenous liquidation and investment decisions by banks, our analysis identifies novel bank-related and institutional determinants of trade and comparative advantage. We investigate the consequences of changes in regulatory capital standards, the cost of equity capital of banks, and in the efficiency of bankruptcy procedures. The liquidation decision and the capital structure of banks drive credit reallocation. When banks terminate poor loans, they typical recover between 50% and 80%, reflecting to some extent differences in bankruptcy procedures across countries. The proceeds of liquidation become available to lend to new firms. But banks must sell liquidated assets at a discount. Their losses shrink bank equity and could lead them to violate regulatory capital standards. Banks are typically not able to raise new capital if they are in financial distress due to large write-offs. Anticipating this, they must raise costly voluntary capital buffers in advance, and the higher the liquidation rate, the larger the voluntary buffer. But if bank capital is too low, banks must postpone the liquidation of bad loans and, with no reserves to absorb losses, they continue on existing credit lines. When they do this, they create ‘Zombie firms’. More efficient insolvency laws help banks to extract more capital when liquidating non-performing loans. This creates an incentive to reallocate credit and shifts final investment and output to more profitable firms in the expanding sector, thereby facilitating specialisation in this sector. Tighter capital standards boosts credit reallocation. When the regulatory capital ratio is high, banks can more easily absorb loan write-offs and, in consequence, can liquidate non-performing loans more frequently. By speeding up credit reallocation, strong banks shape comparative advantage by shifting investment and output to more innovative firms with better prospects. Institutional reforms can make bank equity cheaper relative to debt (deposit) financing.The reforms include better investor protection, or corporate tax reform. Tax reform could eliminate the debt bias by introducing a tax deduction for the notional interest on equity capital. When equity becomes relatively cheaper, banks choose larger voluntary capital buffers. Schepens (2016) found that Belgian banks raised their equity ratios by about 13% compared to other European banks after Belgium introduced a tax deduction like this. With larger buffers, banks can absorb liquidation losses more easily without violating regulatory standards, and accordingly liquidate and reallocate more aggressively. Regulatory and institutional reform can ease the process of creative destruction and help to establish a comparative advantage in innovative industries. We also consider reverse causation, and analyse the consequences of a trade liberalisation scenario, which facilitates specialisation by accelerating reallocation and encouraging entry and exit. A strong banking sector magnifies the gains from trade liberalisation. It supports the process of credit reallocation from declining to expanding firms, and so facilitates the productive specialisation of the economy. We believe that free trade can yield larger benefits if complementary policies can ease the process of factor reallocation and structural change.